September 13, 2016, 10:10 AM · In an effort to promote the coverage of live violin performance, Violinist.com each week presents links to reviews of notable concerts and recitals around the world. Joshua Bell performed the Tchaikovsky with the Tulsa Symphony Orchestra. Tulsa World: "Bell certainly supplied the aural pyrotechnics in a performance that was as assured as it was dazzling." Shunske Sato. Photo by Mark Daams. Shunske Sato performed Paganini's Fourth Violin Concerto with the Australian Brandenburg Orchestra. 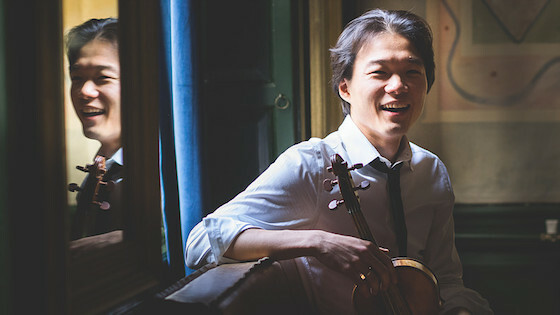 The Daily Telegraph: "Not only was the Netherlands-based 32-year-old gutsy enough to take on the fearsome challenges of the work, he was prepared to do it on a baroque violin using gut strings as well....Sato didn’t seem to need much in the way of reviving breaks. He carried the whole three movements off with amazing elan, power and accuracy, often with a dash of humour, prompting a standing ovation but sadly no encore — a nice little caprice would have been the icing on the cake." Alt Media: "The young Japanese performer Shunske Sato has hit Sydney with his debut performance of the Paganini Violin Concerto No. 4 in D Minor that left the City Recital Hall normally sedate audience rising to its collective feet and screaming for an encore at the end of his opening night performance." Patricia Kopatchinskaja performed Prokofiev’s Second Violin Concerto with the St. Paul Chamber Orchestra. Pioneer Press: "It’s a conflicted concerto, beauty and anxiety often dancing a pas de deux, and the violinist made each abrupt shift gripping, the evening’s meatiest music given a deeply satisfying presentation." Nicola Benedetti performed the Brahms and the Tchaikovsky with the Festival Youth Academy Orchestra. Stratford-upon-Avon Herald: "Ms. Benedetti is renowned for her work with young people and her infectious enthusiasm was a crucial feature of her two concerts last week. Not only is she a magician with her instrument (a Stradivarius from 1717) but she communicates this magic to her fellow musicians and to the audience in front of her. It is not an overstatement to say that she is genuinely mesmerising." Nikolaj Znaider performed the Beethoven with the Dresden Staatskapelle. The Arts Desk: "Authoritative, technically impeccable, glowing with the orchestra’s reassuringly expensive tone, it was a performance you could put on a record and charge full price for. It was also completely featureless."